Eternal Idol, last raced at Pleasanton on 6/27 in a Maiden Special Weight (his first race at age 4). He is by Rff Golden Justice out of Her Destiny (Madraar) ). Dual JC/APHA registered stallion by Blue Eyed Streaker out of Gold Halo. The only blue eyed buckskin Thoroughbred in North America. He has two more full siblings bred on the farm where he came from, so now he isnt alone anymore lol. The White Admiral (IRE) (2005 gelding) former racehorse by Revoque out of Stage Debut. He raced in hurdles in the UK between 2009 and 2011. Once placed 3rd in his 6 lifetime starts. Nordlys (GB) (2013 colt). An overo colt by I Was Framed out of And I. He is a younger brother of Silvery Moon, a famous German racehorse. He is expected to start his racing career in Germany as well. Colorful Tour (1999 - 2013). A roan Thoroughbred stallion by Tour d'Or out of For You and Me. He raced 52 times with 14 wins, 6 seconds and 6 third places. His major wins were the Razorback and the Essex Handicap. He retired to stud in 2008 but passed away in 2013. Sweet Return (2000) Sired by Elmaamul out of Sweet Revival, he raced 38 times during his active career, won eight times, seven times placed second and six times third with total earnings of $1,801,366. He is currently standing stud at Ocala Stud Thoroughbreds in Ocala, Florida. Risque Remarque A dual JC/APHA registered homozygous black frame overo stallion by Ellusive Quest out of Regal Bounty. He is standing at Calumet Farm in Lexington, Kentucky. Moonlark (2007) A chestnut sabino stallion by Gone West out of Laptop. He ran 15 races with two wins, two second and three third places. He is standing at Winning Colours Farm in Australia. Marumatsu Live (JPN) (2004) Shes pink and grey! She is sired by a dark brown/brown U.S. stallion, Lively One, and out of a chestnut japanese broodmare, Toshino Flower. She raced 51 times between 2006 and 2010 with two wins, two seconds and five thirds. Wow. That was a wonderful walk through color! Great thread! Find more! Like! Ooh I'm going to see if I can grab pictures of my BO's three coloreds. A dominant white mare, a palomino sabino son of Guaranteed Gold (now gelded), and their son who is supposedly the only registered dominant white/smokey black TB. But here is the GG son while he was with his breeder - he's Four Feet of Snow. He's now in event training, but his breeder considered racing him. Here's Tater as a foal. His dam was unknowingly fed fescue hay while pregnant, so he was a stunted baby. He was bottle raised for over a week while his dam was at the vet clinic for a retained placenta. Very unfortunate, and the reason why he was gelded. He has gotten MASSIVE since his "brain surgery." Moonlark is stunning!! Thanks for complying the pictures @Rachel! Feel free to add to this, anyone who wants to. Eternal Idol ran at Pleasanton? I wonder if he is on the California Fair Circuit? If so, he may show up at Sonoma County Fair, I will be watching for him in a few weeks. He's absolutely beautiful! Puchilingui (Native Royalty x Carolinaway by Needles) Thoroughbred Stallion. He passed away in 2008, foundation sire for Colored Thoroughbreds. Beautiful Devil (3 year old granddaughter of Patchen Beauty). 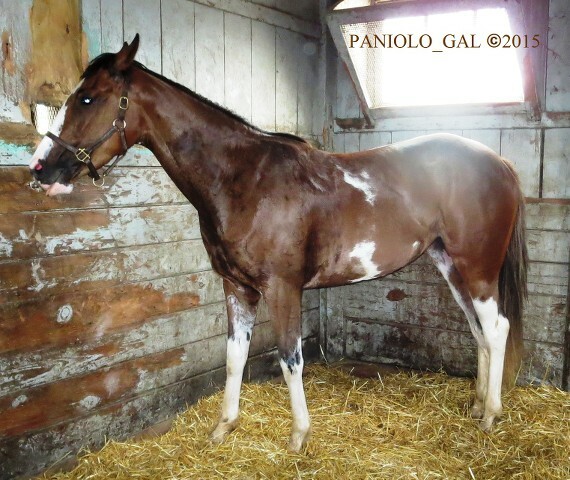 She won race 4 at Balterra yesterday (7/4/2015). Not a fan of white thoroughbreds. Love the greys. Room for all tastes. I wonder if they sunburn, the pink skin would concern me. Greys, even without pink skin, are subject to higher rates of melanomas. It must be even worse for pink skinned horses. I'm not partial to white horses myself, but she would be lovely in any color. Thank you for putting this together, Rachel. Really enjoyed looking at all these unique horses, although I was sad to learn that Colorful Tour has died. I had unsuccessfully tried to find information about him. Hopefully there is some sort of sun block for these lighter skinned horses. I know they do make fly masks with longer fronts to cover the light muzzles on horses with blazes or other white markings. Knowing the risks of melanoma, I think I'd keep a turnout sheet on a white or gray horse. If I'm not mistaken, you can actually use normal sunblock on horses, but I think they also make sunblock specifically for horses. I've definitely seen it on a horse before though. There is one I am going to post about names Koda Chrome he has a paint pattern to him. I'll post pictures in a little bit. Some people use something similar to special fly sheets to protect them. Quite the dynasty that Beautiful devil comes from; damline of course. I have a photo to contribute to this topic that I took on my recent trip to Lexington. According to her trainer/rider that was on site, the name of this "sabino" filly is Painted Princess (2012f) by Stephen Got Even out of Turf Club. She is listed as a bay in the TB registry.